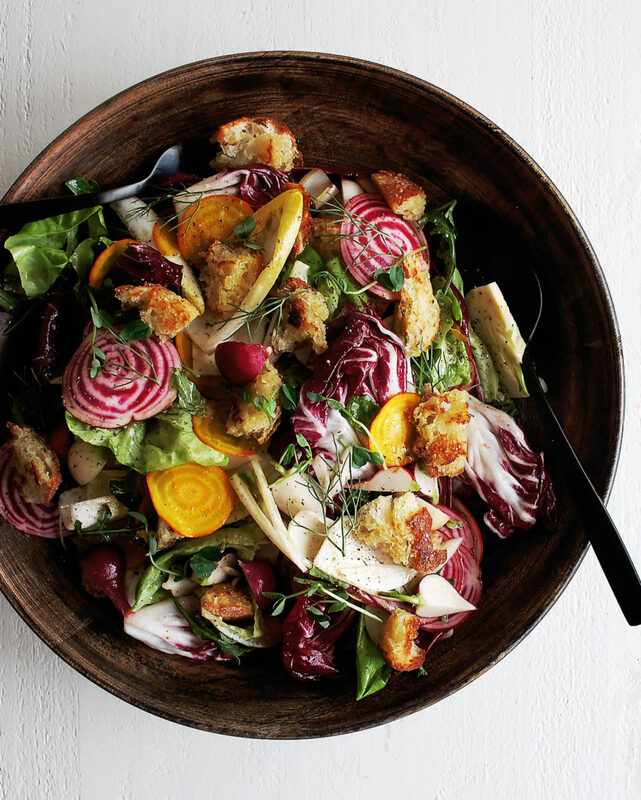 In between all the comfort food we’re eating during these winter months, nothing’s better than this Rustic Winter Salad. This salad is crunchy, refreshing, and so satisfying because of the flavorful vinaigrette and homemade torn croutons. 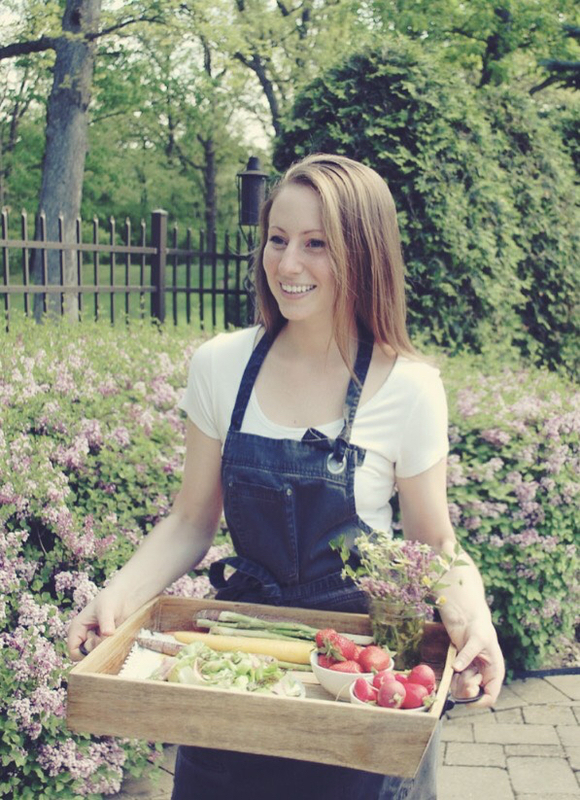 I couldn’t think of a better salad to celebrate all of the beautiful winter produce. I think during the winter we always tend to think vegetables (and really any ingredient) always need to be cooked. And while I do love braising and roasting foods during the winter, sometimes you just need something crisp. 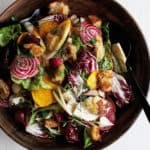 This salad combines raw vegetables with a vinaigrette full of sherry vinegar, pomegranate juice, a little maple syrup, and fresh tarragon, and the most delectable crispy homemade torn croutons. I make the croutons by tearing some bread and toasting the pieces in a pan with some olive oil. Simple as that. I hope you absolutely love this!! In a mixing bowl, whisk together the sherry vinegar, pomegranate juice, lemon juice, and maple syrup. Slowly drizzle in the olive oil, whisking until incorporated. Stir in the tarragon and salt. Heat a large sauté pan over medium heat. Add enough olive oil to fully coat the pan and come up the sides about ¼ of an inch. When the oil is hot, toss in the torn bread. Toast the bread, stirring often, until golden and crispy on the outside, but still slightly soft on the inside. Transfer the croutons to a paper towel lined plate and season with a pinch of salt immediately. Cut the root off each endive. Separate the leaves and throw them into a bowl. Repeat with the radicchio, tearing the leaves as needed, but keeping them nice and big. Add the radishes, fennel, both beets, butter lettuce, and arugula. 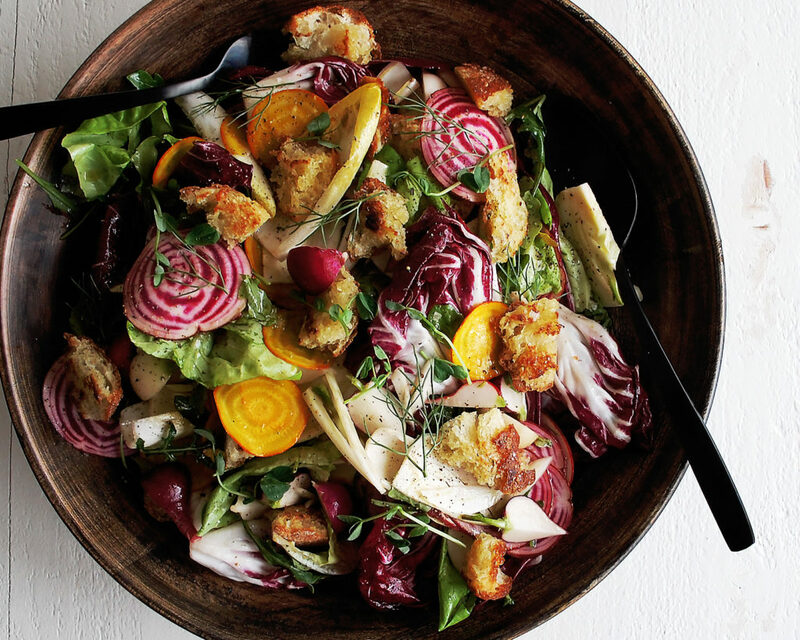 Toss the vegetables and lettuces with the vinaigrette, adding in small amounts at a time. Save any leftover vinaigrette you may have for another use. Plate the salad in a large bowl and top with the torn croutons.